Try Bingo games. We have some cards you can download and print over on our Bingo page, or you can make your own cards using your child's spelling words or words they should be able to read. 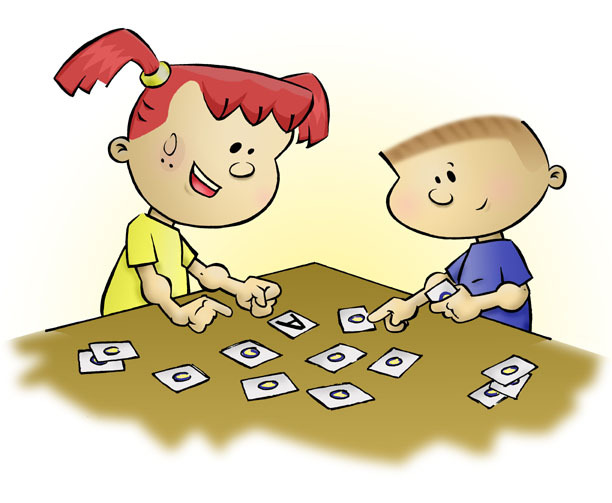 For beginning readers, try Sight Words Bingo, which teaches high-frequency words, or Early Phonics Bingo, which includes short words that are easy to sound out. For more about Bingo, for blank Bingo cards (fill in yourself), and for holiday Bingo sets, see our Bingo page or visit our Holiday Activities. Search Hidden Pictures for beginning sounds. Children enjoy looking for items that begin with the sounds they are learning. This can be done with illustrations in a book or pictures in a magazine - or in our hidden pictures that focus on individual letters. Try some mixed-up word games. We offer several fun word games, all of which are listed below. Children love these games because they can get pretty silly. "Add-An-Adjective" is a game where you get a story that has many of the adjectives missing and fill them in with your own. We have several holiday-themed stories on our site. "Silly Sentences" is a game where you randomly choose the beginning of one sentence and the end of another sentence and then put them together. "Homonym Phrases" is a game where words come together in ways that seem to make no sense. But when you listen to the words you are reading all together, they sound like well-recognized phrases. "All the Wrong Rhymes" is a game where you're given entire phrases and piece them together in the wrong places. If this wasn't exactly what you were looking for, check our Reading Activities page.